I’m still absolutely committed to finishing the game! I’m currently investigating other ways to make it available (several other stores look like possibilities). If you’ve already purchased it, your itch.io download page will still work, and you will still be able to access all future updates through there. I still think itch.io is bloody amazing and want it to succeed. The owner/operator of itch.io has said that he is working on EU VAT compliance, so it’s possible that nothing might change for Lenna’s Inception come January. Although it is still quite hard for me to imagine what he would be able to do. 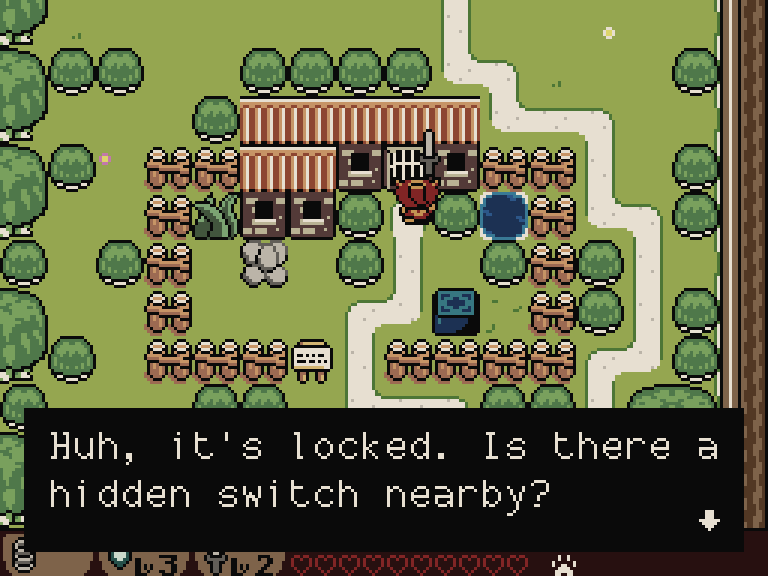 As per usual, in order to access most of the new features you’ll need to visit the starving artists’ house in the town and speak to the NPC inside to regenerate your maps. This won’t cause you to lose any progress. By the way: I’m going to be giving at talk about procedural generation at the start of #procjam on the 8th of November. Tickets have already sold out for attending in person, but the talks will be streamed online! Check the website and @procjam to keep up to date on the details for that. I strongly encourage you to take part in the jam as well if you’re curious. I’m really looking forward to it! 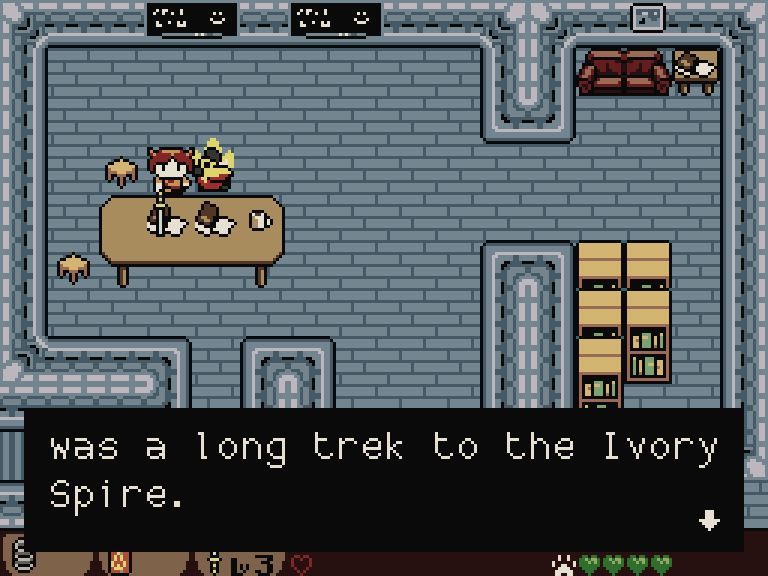 New story-line character Delvin is introduced during the “save the prince” quest. Progression in the main arc pursuing the Archangel that killed Lenna’s students. Unfriendly guards in the main town. New boss fight at the current end of the story-line content. This is the penultimate boss fight, so the final boss is still yet to be added. 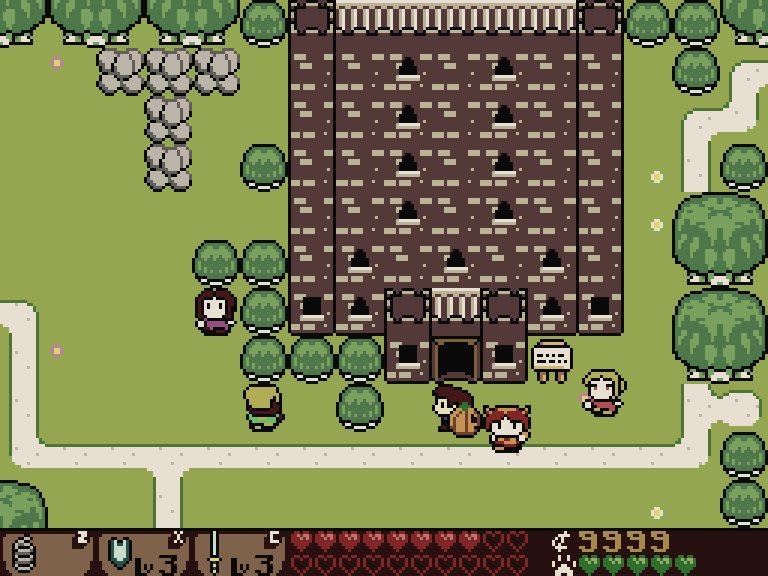 Lenna’s Inception version 0.5 (beta4) is live. Get it from the usual place. Random ursine (i.e. 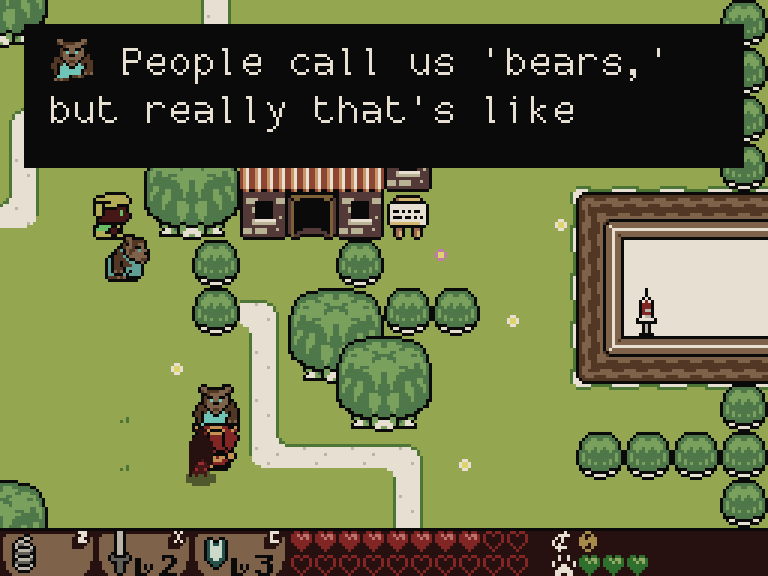 bear) NPCs have been added. The shopkeeper is now an ursine person at the start. 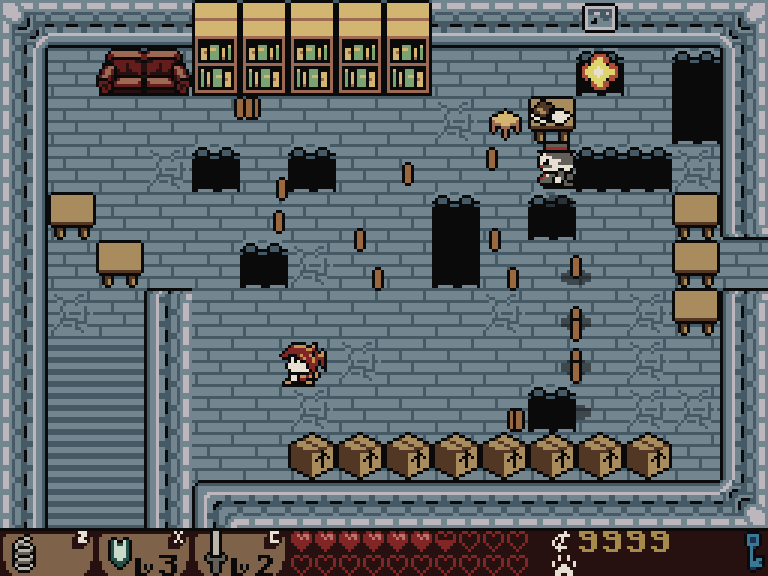 The shop is taken over by the human shopkeeper halfway through the game. The Damascus Katana is no longer found in a dungeon. You must do the blacksmith’s quest to get it. More story-line and cutscenes have been added (roughly 50% complete now). There’s a slightly modified cutscene inside the palace if you find the prince before visiting there. When you enter a boss’s chamber, the dungeon music fades out. 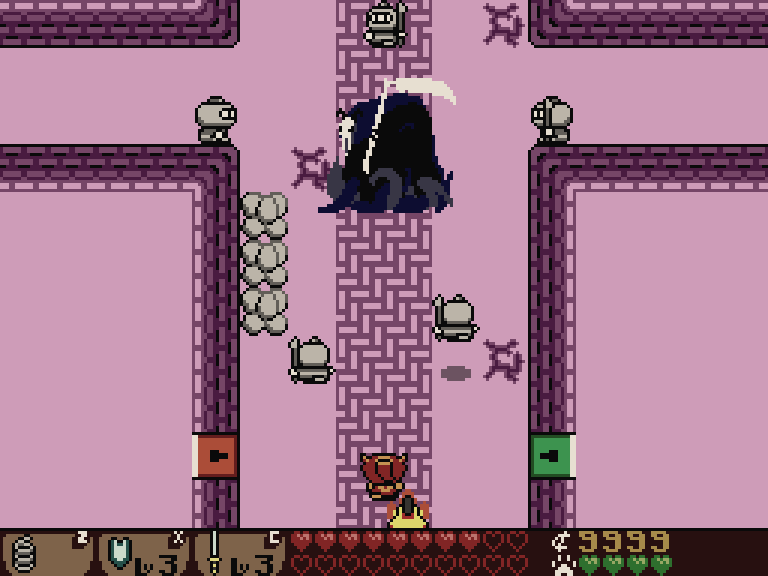 In the overworld, most tracks don’t swap immediately, but only after the current one has finished. Temporarily switching into the glitch or victory music will no longer cause the previous track that was playing to reset and start from the beginning. The lost library books “Tursiops Sapiens” and “Ursus Sapiens” have been written. 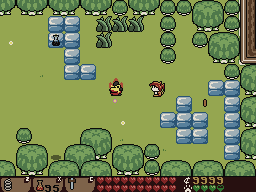 NPC and pet AI has been improved to hop over the fewest obstacles necessary to reach the required tile. Roads no longer disappear under obstacles (and avoid going under walls and obstacles where possible). A bug causing the virtual screen to sometimes (rarely) move permanently from its usual central location is believed to be fixed. Tunics appear as random drops more frequently. The secret room in the library has moved. Roads are better designed now. Rather than go everywhere, they tend to hint at the way to go. Going off-road is more likely to get you interesting loot, however. I’ve put up the second article on procedural generation in Lenna’s Inception over on my dev blog at bytten-studio.com. Go check it out! In the previous post in this series we saw how terrain is generated and how the procgen system decides each area in the world will be connected, which controls the progression of the player through the game. In this post I explain how the contents of those distinct areas are filled. 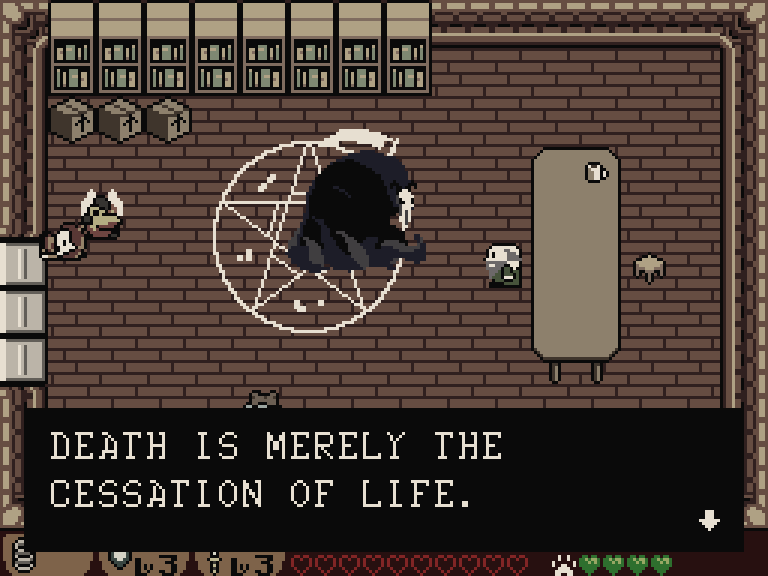 As mentioned earlier, while Binding of Isaac and Spelunky use hand-designed templates to generate this content, Lenna’s Inception takes a different approach. This part of the procgen system is aware of the spatial relationships between objects. 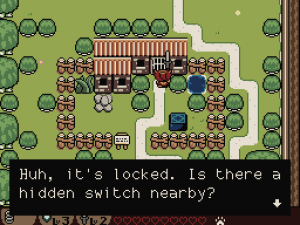 By formalizing (making strict machine-readable rules) the constraints each kind of tile places on its neighbors, the system can choose where to place randomized objects without breaking the game. 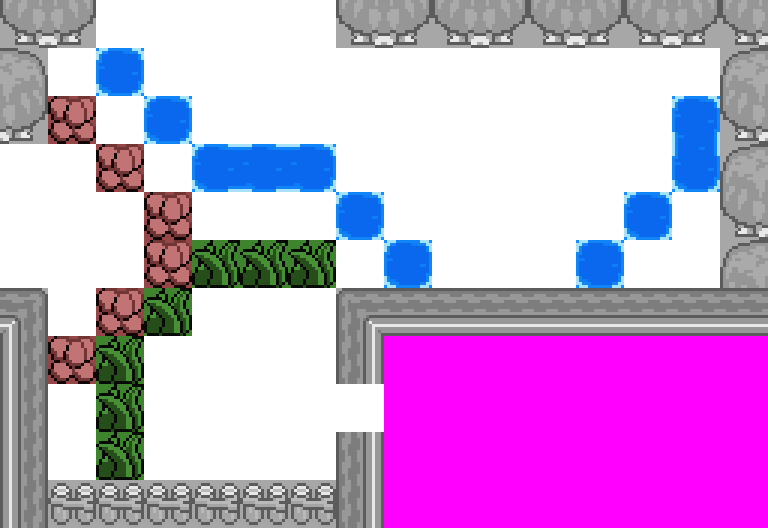 As an example rule, a cracked rock requires floor next to it so that a bomb can be placed there. If it was placed next to some water, the bomb would sink and not blow up the rock. The system understands this could prevent the player from progressing and will not by default put water next to cracked rocks. 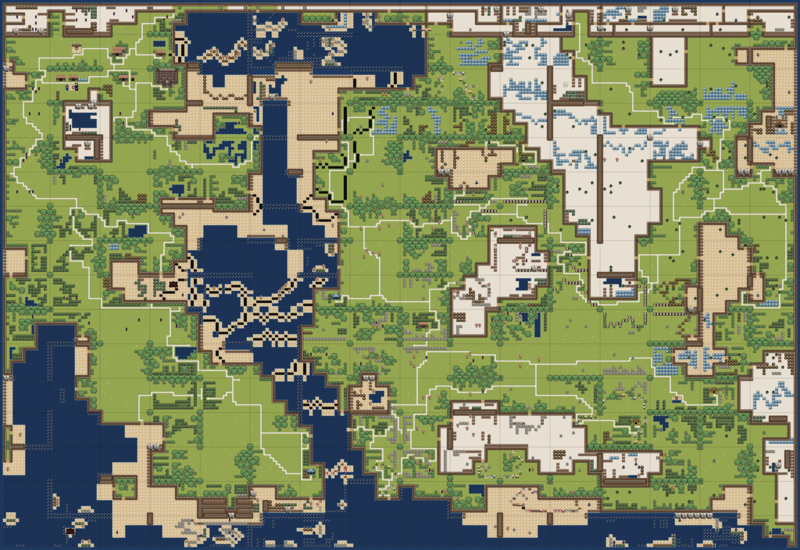 I’ve started a series of posts on procedural generation in Lenna’s Inception over on bytten-studio.com. Go check out the first part! How is Lenna’s Inception different? The second part of this series (and its conclusion) will be on Monday next week. To be honest, calling this metamorphosis process “evolution” would not be a good way to honor Darwin. Quick reminder first: beta3 is available right now. 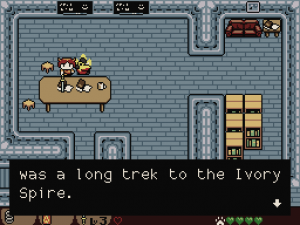 Among other new features, it includes randomized potions and tunics. Go and download the update if you haven’t already! If you’ve been collecting the lost library books, you might have noticed the title of one of the books hints at an intelligent race of bears. Although I haven’t written the content of the book yet, these bears are now wandering around in my development builds! 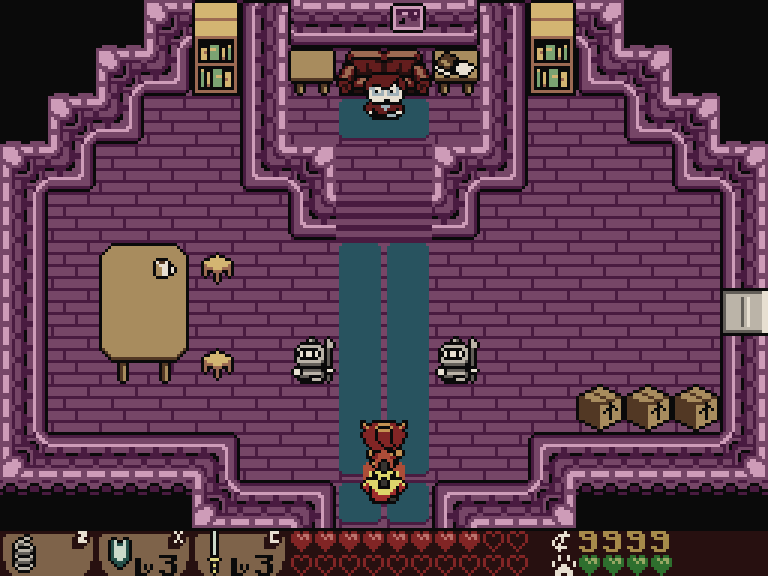 Lenna’s Inception version 0.4 (beta3) is live. Get it from the usual place. Drop it on yourself to try out its effects and find out what it does. If you’re standing in the same place as your pet, you’ll both get the effect. Throw it at a distant pet or enemy to grant that pet or enemy the potion’s effects. Throw it at the ground to create a puddle. When any mob (enemy, pet or Lenna herself) walks over this potion, it’ll be granted the potion’s effects. Launch a potion across the room with the bow (which does not require any arrows). This is often the most convenient way to deliver the potion to a pet that is standing next to you without also taking the effect yourself. Rare alternative tunics have been added. 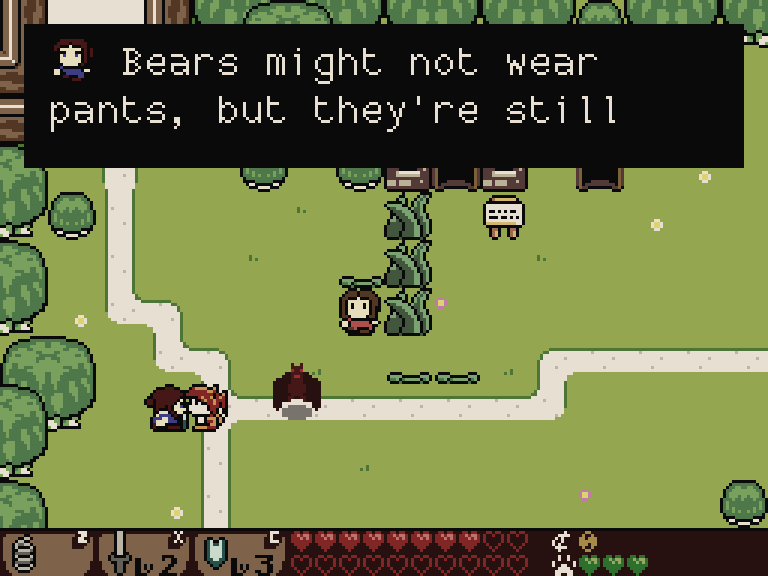 When you find or buy one, you can equip it by choosing “Change Lenna’s Tunic” in the inventory screen. 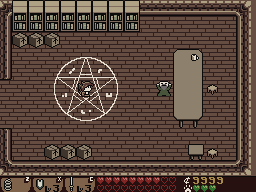 Like potions, these tunics are randomized and have effects on the player character, much like the potions. The hammer can now be used as a weapon. 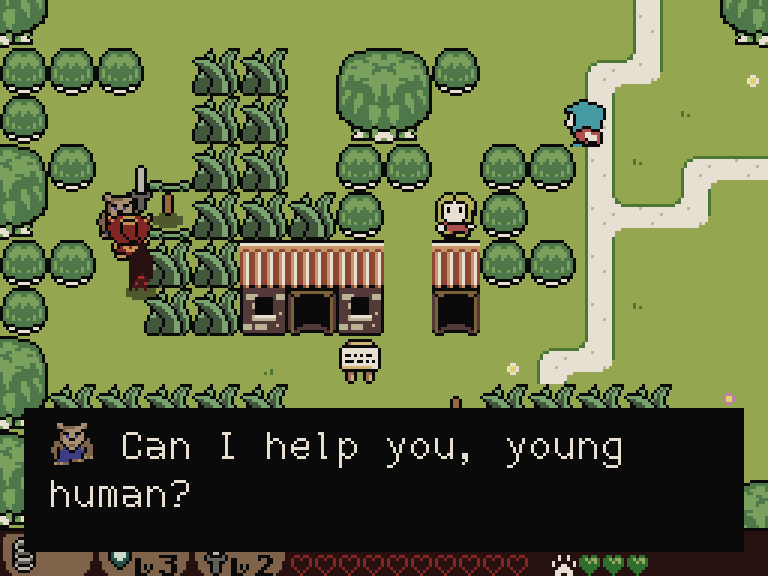 Randomized NPCs have been added to the “town” area. Some give you items, and some sell items, although most tell you the latest gossip. The palace location has been added and is the first destination you must head to after the school (if you’re following the storyline, otherwise it’s optional). The first four bosses in story mode now speak before attacking. New music has been added to the palace location and the dungeons styled after abandoned buildings. 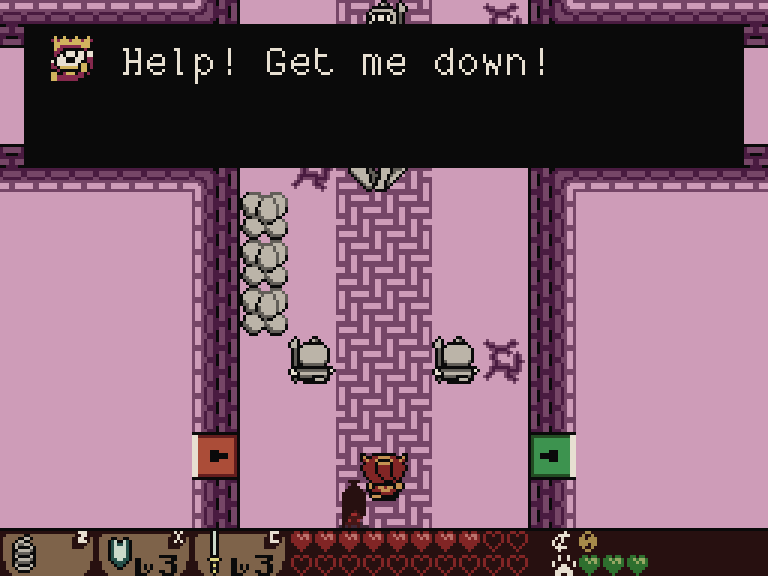 When the game starts, Lenna’s students are killed and she sets off to report this to the guards at the palace. Until now, the palace has only been mentioned in dialogue. Now it’s a real location. Some weeks I take part in an event in the twitter and reddit game development communities known as ScreenshotSaturday. It’s an opportunity once a week to share screenshots with other developers and find out how your favorite projects are coming along. If you’re curious what I’ve been working on for beta3, my submissions are below. The healing tunic is one of many tunics I have planned. It gives you half a heart about once every 5 seconds. 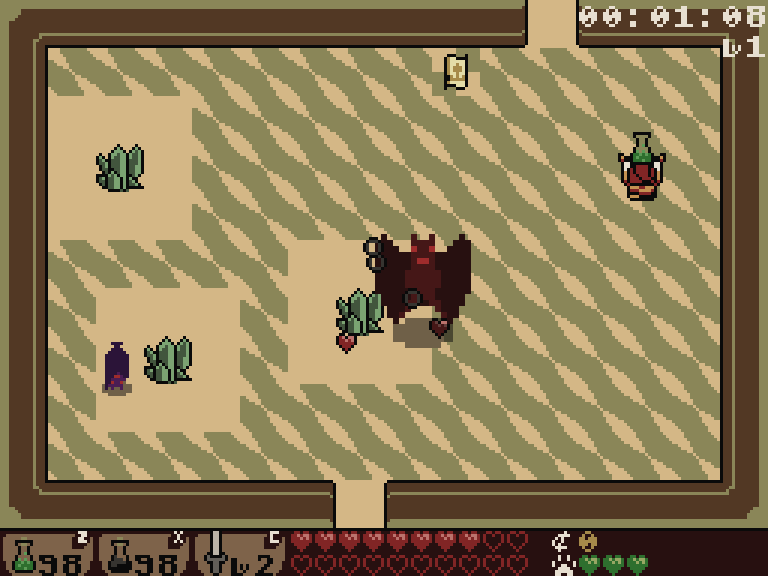 The same effect system will be used for the randomized potions, and for boosting the abilities of certain enemies. I’m hoping people will figure out neat ways to combine effects, e.g. donning an explosion tunic, quaffing a blast protection potion, and then walking into a group of enemies to blow them up unharmed.